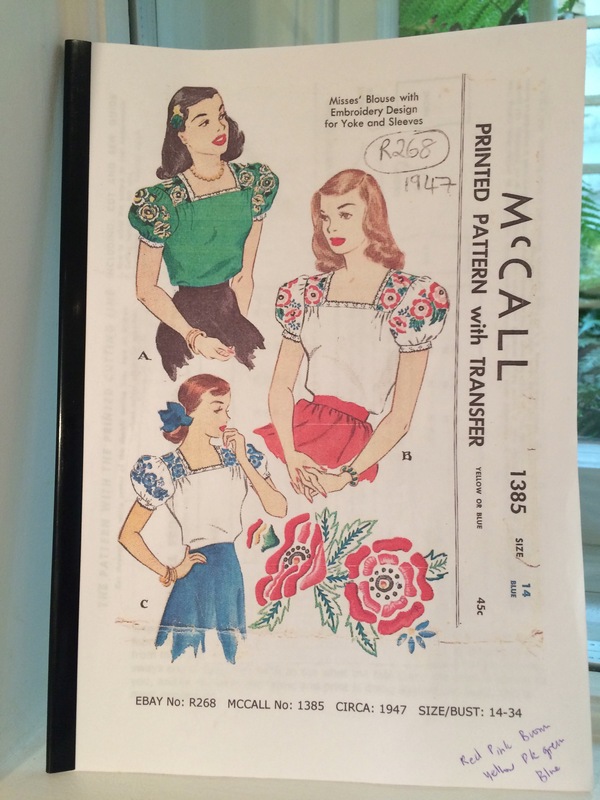 You may remember my McCall 1385 blouse pattern, from 1947. I shared the embroidery techniques I have been using. 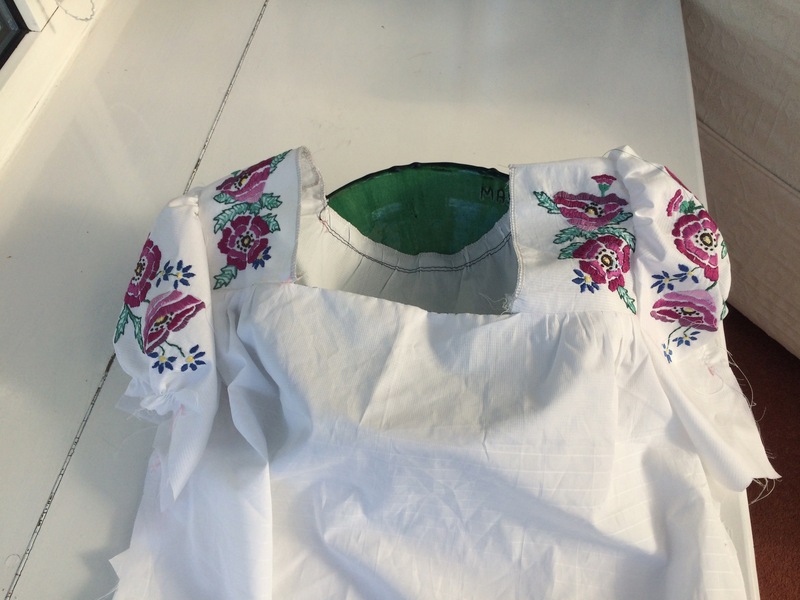 Once complete, and pressed, I attached the yokes, joined the blouse at the shoulders, then basted in the lovely, puff sleeves, replete with embroidery. You can see the black basting stitches across the back. I put a few in the front too as my upper chest is a bit on the narrow side. Then I tried to insert the gusset. Arrrghhh! Horrible. Difficult. I consulted the not-very-clear-instructions. I took it up, pinned it. Unpinned it. Basted it. Rebasted it. Basted it with green thread. Stitched it. Tried it on. It was not right. It was tight. Unstitched it. Partly stitched it. Peered at the instructions again. Tried to make out the diagram which had not printed very well. Sewed it very carefully with tiny stitches in the corners. Looked at it. Decided it was in the wrong position. Tried to pin the paper pattern to the other sleeve in a different position. Consulted the instructions. Put it down. Went to a party dressed as seaweed lady (draped with a bit of green lace) rather than wearing my new blouse. Drank lots of tea. Went to bed. The next day I got out the Reader’s Digest Complete Guide to Sewing and found it helpful, but not conclusive. I think the issue of gusset insertion requires a post of its own (to follow). Finally once the gussets were completed I finished the blouse with some nice, cotton lace that I got from Harrington’s. I used two different widths – the wider one to finish the sleeves and the narrower one around the neck. The hem was just a simple, folded over and machined hem, that will generally get tucked away. My one thought had been that the square neck was not my best look. But it is fairly petite opening (the blouse is pulled on over the head), and I think it works well with the puff sleeves. 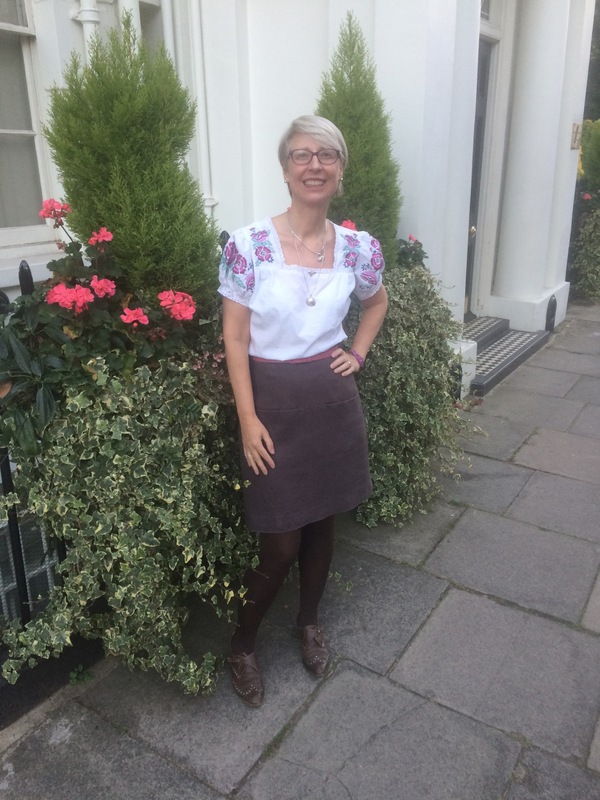 I am wearing a Vogue 1247 Rachel Comey skirt in brown linen. 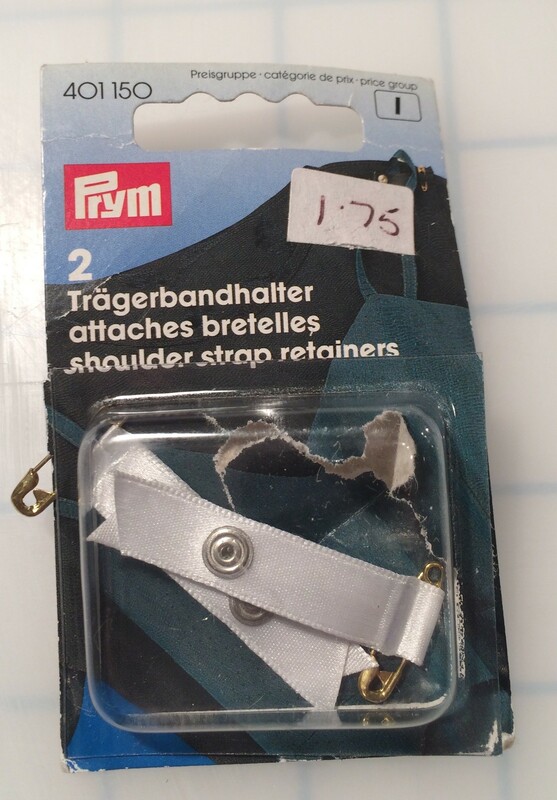 I had to use some of these “shoulder strap retainers” to keep the straps of my brassiere at bay. I think I will take off the safety pins and attach them permanently to the shoulder seam. Here is a close up of the embroidery and the lace. I really love this blouse. The pattern. The colour-scheme. The embroidery. The lace. The style. The history. But the gussets? That’s another matter. What a beautiful blouse!! It’s so lovely!! Gussets are traditional with rectangular construction techniques, and were often used in historical times. Many people find them easier to insert if hand stitching instead of doing them on the machine. I think your embroidered blouse is lovely and you did a splendid job! Whelph. . . where do those gussets go? Under the arm? I really would have appreciated a photo of the gussets in situ, you know, as you were wearing the blouse. I once made a “medieval” robe with underarm and side gussets, and found them difficult. I also tried pants with a crotch gusset (which I’ve seen in karate pants). The result was not particularly good. So, if you’re going to write an instructional post, I’m all eyes. Yes, under the arm Felicia. Detailed post coming soon…. I wonder what is the advantage of having a gusset as opposed to a whole sleeve piece? I too look forward to your post on “The Gusset – friend or foe and it’s place in sewing”. At least you have completed one now so the next one should be a doddle. The embroidery is very pretty and the blouse looks sweet on you. I have just finished an embroidered elephant and made a cosmetics bag with it. I love embroidery. What a beautiful blouse Kate. Sorry to hear the gusset gave you such trouble. Your struggles were definitely worth it though as the finished piece is really lovely. I think the square neckline suits you as well and works perfectly with the embroidery on the shoulders. 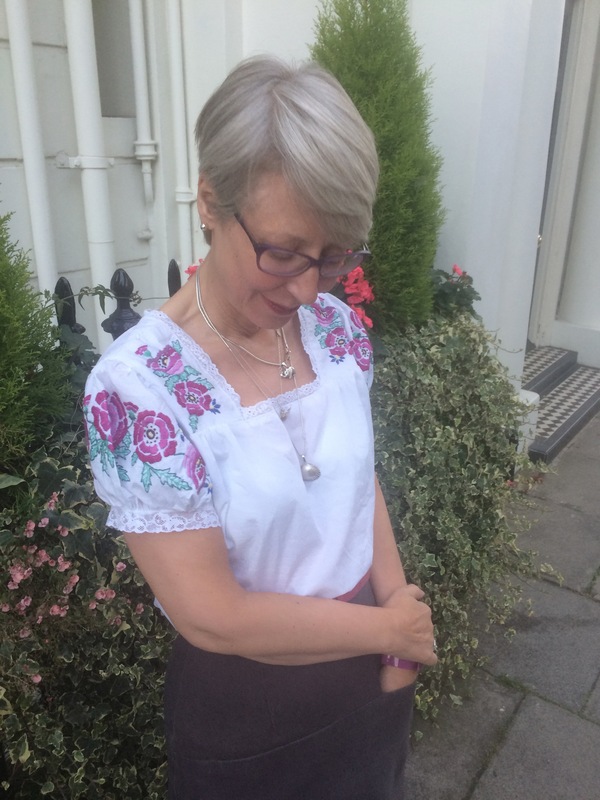 This blouse brings back memories of a denim jacket I embroidered – I think when I was in 6th form – my friend and I both did one, with floral embroidery across the back yoke and the collar and cuffs covered with contrast fabric. I loved mine and someone stole it when I was out one day. Its beautiful, the embroidery is lovely! That’s incredible work – congratulations. That’s gorgeous and so “on trend” right now. You look lovely in it! Well done with the gussets, they are tricky things. Its beautiful Kate. Well done on your embroidery – I used to do a lot of hand embroidery, but I don’t think I have the patience any more! Gussets can be tricky, glad it worked out in the end. This is spectacular and well worth the wait to see it finished. this blouse looks very sophisticated (I was imagining a peasant sort of thing which is great too). Enjoy wearing it. I’ve tried to insert a diamond gusset before and after lots of faffing ended up with a bit of machining and finishing with hand stitching. Exquisite. The embroidery looks terrific! So many diligent hours of hand sewing but struggles with a gusset…at least it gives you another opportunity for a post…maybe that is not a good thing? It just looks darling on you and the colors suit you too! Thanks for sharing this adventure! Your blouse result is worth all the angst caused by the gussets. Wear it with pride. Really lovely. Youv’e done a brilliant job. Well, I sympathize with your gusset quandary–I could never understand them when they were covered in my sewing classes. But I see that you figured them out and ended up with a triumphant result. You look wonderful! Hi Linda – thanks so much for your kind comments. I’ll pop over to you soon. Your embroidery is fantastic! I would be so proud if I finished that much! Lovely hand work Kate. The lace is so pretty and the top as a whole is so very very charming. Well done, as always. Beautiful, the embroidery sets it off lovely. I associate gussets with kimono type sleeves and not so much with set in ones. I understand that you wanted to keep authentically to the pattern and I’d like to know your thoughts about them, looking forward to that. I love your blouse and think it looks great on you. Fabulous embroidery. Thank you for the link to Harrington’s, could be very useful, only thing is I couldn’t see any prices, perhaps because I’m using my tablet. I’ve made bra strap retainers before and they were included in the Susan Khalje class I’ve just watched. Very useful. What a lovely blouse! And it suits you well. I like the combination with the skirt and the shoes, it does not look to folkloristic…I never ventured into gussets, so am awaiting your turorial avidly. By the way, can I ask if that is a self drafted skirt or from a pattern? The two together are great. It’s Vogue 1247, an internet favourite. If you search this pattern on my blog you will see I have it in brown and navy and it gets a fair bit of wear. So pretty! No wonder you love it (in spite of those obstreperous gussets). I really like the square neckline, the lace stands out nicely. And superb job with the embroidery. Absolutely lovely! The embroidery is beautiful and the square neckline very flattering. Looks quite classy with your skirt. oh exquisite embroidery and sewing, just beautiful result. As a young girl I remember Mum making me a dress with gussets under the arms and they gave her a lot of trouble. Never encountered them myself but obviously they serve a purpose with fit/movement around the armsythe. What a triumph. It is beautiful but it made me a little sad thinking of my late mother who was a talented embroiderist. Yes, somehow embroidery is a past, pastime. My grandma made a lot of tablecloths. We hardly ever use them.